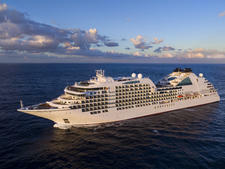 When the contemporary-styled Seabourn Odyssey debuted back in 2009, it was hailed as a revolutionary new ship design for Seabourn, a line whose style had previously been more traditional. Odyssey had a freshness about its interiors, with sleekly decorated public spaces and larger-than-average all-suite accommodations outfitted with up-to-date tech enhancements. It also offered a more expansive variety of restaurants than had been previously offered on a mainstream luxury cruise ship. It's been years since Odyssey debuted, and the big message that came through loud and clear on our voyage was that the cruise line got a lot right in the first place. The ship feels just as fresh, with its lofty floor-to-ceiling windows in both public spaces and cabins. Its color scheme -- mainly airy whites peppered with a range of hues, from the exotic deep red and black scheme in the R2 specialty restaurant to the earthy and relaxing natural browns in Seabourn Square -- feels light and airy. A few tweaks make sure the ship feels modern, including a partnership with famed U.S. chef Thomas Keller, whose menus and dishes appear onboard in several restaurants, and new spa suites to replace underused spa space. Beyond the interiors, the 462-passenger Seabourn Odyssey is designed for a sophisticated traveler who wants a balance of experiences. It offers a very social atmosphere; for example, dining is open seating allowing passengers to choose their companions. Trivia, held on sea days, is massively popular; on our sailing 25 percent of all passengers participated. There are plenty of chances to interact with your shipmates via a number of socially driven opportunities. Particularly fun was a fabulous "corridor party," held at the beginning of the cruise, when passengers socialized with their cabin neighbors with the help of Champagne and hors d'oeuvres, served by wait staff, and introductions, provided by officers. One of Odyssey's greatest charms is that it has a generous space ratio. Even on a sea day it never feels crowded in the main pool area. There are so many lovely nooks and crannies tucked all over the ship it can you take you the whole voyage just to find them. 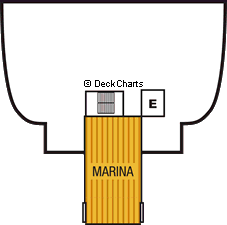 (Start with the aft deck at the back of Seabourn Square or the forward whirlpool, tucked into the bow, on Deck 6.) Staterooms, from standard suites to the splashy Wintergarden, the ship's largest, have deep balconies, separate sleeping and sitting areas and dining tables. 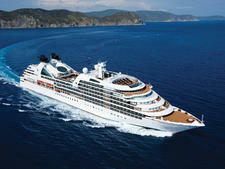 In other areas, Seabourn could improve the overall experience on Odyssey. Evening entertainment, particularly lavish production shows, feels stale. There's plenty of enrichment through onboard lecturers, but very little when it comes to educating travelers about itineraries (and virtually nothing on the line's intriguing partnership with UNESCO and its heritage sites). Suites are well appointed but have not been significantly updated recently; iPhone chargers that only fit older models, a lack of plugs and charging devices throughout, and an interactive television that has been surpassed by newer technologies all show the ship's age. Inconsistent service was perhaps the biggest disappointment on our trip. This matters because impeccable service is a Seabourn hallmark. In some areas, particularly in dining venues, it was as sensational and intuitive as you'd expect. In others, the levels of service seemed below standard. In particular, bars and lounges seemed understaffed and servers were overwhelmed. Our cabin stewardess, who did not properly clean the suite on the first day and committed various other infractions throughout our stay, was not Seabourn quality. And if first impressions count, our sluggish and impersonal embarkation process is handily beat, in quality and efficiency, by a recent voyage on a 6,100-passenger ship. Seabourn Odyssey, in the end, offers an excellent cruise experience that balances elements of traditional luxury cruising (all-you-can-eat-caviar and butlers in high-level suites) with contemporary features, including a range of dining options and shore excursion menus that include active excursions alongside more passive ones. 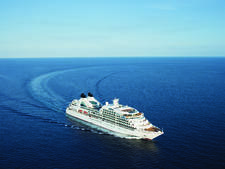 On Seabourn Odyssey, passengers are primarily well-traveled couples aged 50-plus. Shipboard life is also suited to solo travelers and groups of friends traveling together. Most hail from English-speaking countries such as the U.S., Canada, U.K., South Africa, Australia and New Zealand. Daytime wear is casual, but what Seabourn considers casual is more upmarket than big-ship dress codes. It's truly a country club-style of dress; loungewear at the pool, rather than shorts and T-shirts, for instance. Jeans are welcome in all dining venues during the day, but not appropriate in any public venues after 6 p.m.
Seabourn recommends one of two categories for evening attire: Elegant casual and formal. The elegant casual dress code is in place on most nights. Elegant casual attire includes slacks with a collared dress shirt or sweater (jacket optional) for men and skirt or slacks with a blouse, a pantsuit or dress for women. On the rare formal night, which only applies to dining in the Restaurant, the ship's main venue, men wear tuxedos or suits (jacket required) and women wear dresses or flowing pantsuits. In all other restaurants onboard, the elegant casual code prevails. Seabourn Odyssey is reasonably inclusive. All of its dining venues are complimentary. Open bar exists throughout the day and night, with wine, spirits, beer, soda and water. Wines are poured with lunch and dinner, gratis. Gratuities are not required (or expected). Other freebies include Massage Moments on the pool deck on sea days (depends on availability of therapists) and a free "Shopping with the Chef" tour (capacity limited). Internet access is only included for upper-category suites. 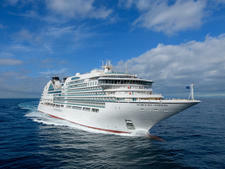 A 10 percent gratuity is automatically added to spa treatments, and passengers may up that amount if they wish.